Record O’Neill Cup winners Carrickmore justified their favourites tag to advance to the quarter final of the senior championship but not before they were given an almighty fright by Greencastle at Healy Park on Friday evening. In an entertaining first half Carrickmore led by six points with twelve minutes of the half remaining with Caolan Daly, Johnny Monroe, Mark Donnelly and Martin Penrose all bagging fine scores. However the accuracy of Cahir McCullagh and a quality score from Danny Tuohey kept Greencastle in the race. Indeed had McCullagh and Mark Carson shown a bit more composure from placed balls the half time score could have been much closer than the 0-8 to 0-5 lead Carrickmore enjoyed. Greencastle came out in the second period in determined mood scoring four of the first five points of the half to level the game at nine apiece. McCullagh hit a beauty from long range after only 12 seconds with John McCullagh adding a brace either side of a Carson free. Former Tyrone attacker Martin Penrose and Mark Carson swapped scores before Carson and Cahir McCullagh were wide from placed balls. However Greencastle will look back on this one as an opportunity lost having recorded 16 wides over the hour. 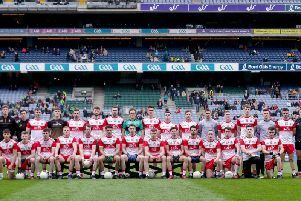 Driven on by former Tyrone star Conor Gormley and Barry Daly the favourites pushed for home outscoring Greencastle six points to one in the closing 12 minutes to win 0-16 to 0-11. Sean Loughran, Barry Daly and substitute Paul McAleer were the men whose points sealed the win for Carrickmore. Greencastle finished the game with 14 men after Dan Tuohey picked up a second booking late on. Carrickmore will know themselves that they will have to improve but no doubt they will be looking forward to next weekend’s quarter final. Disappointment for Greencastle but they will have to learn from this experience and they need to ensure that they are still in the top flight next season. Carrickmore scorers – Martin Penrose 0-5, Barry Daly 0-2, Mark Donnelly 0-2, Sean Loughran 0-2, Caolan Daly 0-2, Niall Loughran 0-1, Johnny Munroe 0-1, Paul McAleer 0-1. Greencastle scorers – Cahir McCullagh 0-5, John McCullagh 0-3, Mark Carson 0-2, Dan Tuohey 0-1.